The rugged terrain, inland lakes, interesting bogs, and unusual depressions known as Devil’s Soup Bowls provide Yankee Springs Recreation Area with ideal hiking qualities. Its location, almost centered between the urban areas of Grand Rapids, Kalamazoo, and Battle Creek, makes it a popular park with everybody. Yankee Springs has more than 16 miles of designated hiking trails but few of the routes are loops. One of the few that is, Hall Lake Trail, is also one of the more scenic walks in the park when combined with the connector to the Devil Soup Bowls for a 3.4-mile outing. There is no longer an overlook from Graves Hill, foliage now blocks out all views except in late fall and winter, but the Soup Bowls are interesting and the hike along Hall Lake scenic. Although there is a bit of climbing to Graves Hill and around the Soup Bowls, the trails are wide, well posted and can be easily hiked in running shoes. There are lots of wildflowers and trees to identify, but don’t expect to encounter much wildlife in midsummer. With more than 700,000 visitors annually to this 5,200-acre state park, you can bet that the residents of the woods remain well hidden during the day. 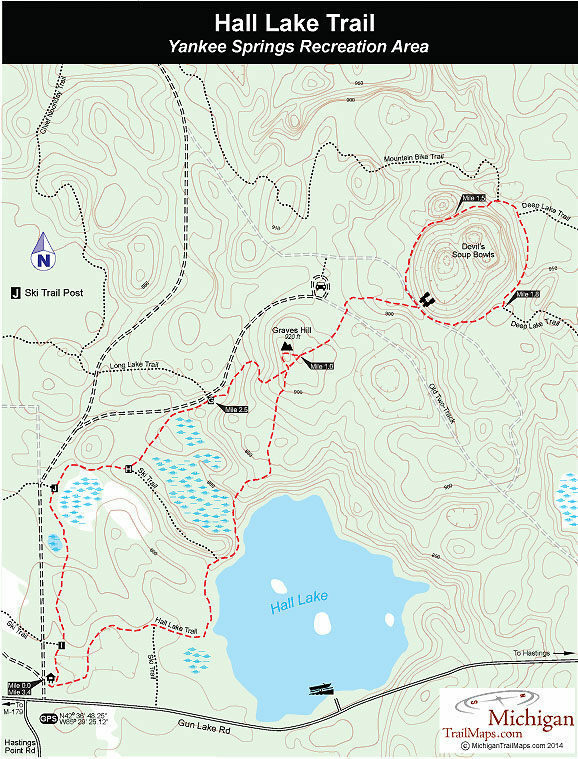 Hall Lake Trail is a 2-mile loop to Graves Hill that begins with an immediate junction with the return loop. By heading up the right-hand fork you pass the posted junction with a winter ski trail in a quarter of a mile and arrive to a view of Hall Lake at Mile 0.4. The trail here is wide and easy to follow as it crosses a bridge and then skirts the lake for the next quarter of a mile, providing good views of the islands in the middle. At the northwest corner of the lake, the trail begins to climb gradually and then leaves the watery view for a sharper ascent to the high point. Just before Mile 1, you reach a junction with a bypass around Graves Hill and the return loop that’s posted as the route to Long Lake and Chief Noonday Trails. Head straight and in less than 100 yards will be standing on Graves Hill but most likely not seeing much. The highpoint with an elevation of 920 feet use to provide a view of the wooded interior of the state recreation area and a portion of Gun Lake. But now, other than late fall and winter, foliage obscures the view. A trail leads northeast off the highpoint and is posted as the route to Devil’s Soup Bowl. You quickly cross an old two-track featuring the orange markers of a snowmobile trail and at Mile 1.3 arrive at the first Soup Bowl where a wooden fence keeps hikers from peering too far over the edge. The bowls are very steep, glacially carved depressions known as kettles. Follow the trail in a clockwise direction around the large soup bowl and in at Mile 1.5 you’ll find yourself tiptoeing a narrow ridge with the large bowl to the right and the small one to the left. With a simple twist of the head you can look into both of them. The steep climb follows that tops off at a junction posted as the Deep Lake Trail and the mountain bike trail. Head right and right again in less than 100 yards. At Mile 1.8 the mountain bike trail departs to the left while you’ll continue skirting the large soup bowl and at Mile 2 you’ll return at the fenced overlook. Backtrack to Graves Hill and follow the return loop marked for Long Lake Trail. It’s a steady descend off the glacial moraine that bottoms out at Mile 2.5 near the park road. Here Long Lake Trail heads west for the interior of the recreation area. 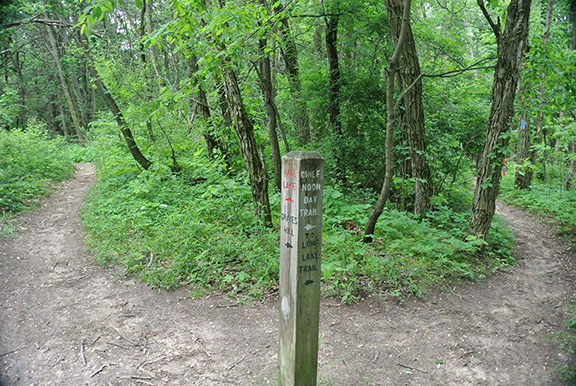 Hall Lake Trail is the lefthand fork that continues to the southwest, passing three junctions with ski trails, each marked by a letter. At Mile 3.4 you emerge at the trailhead. There is parking for three or four cars at the Hall Lake trailhead but no other facilities or drinking water. 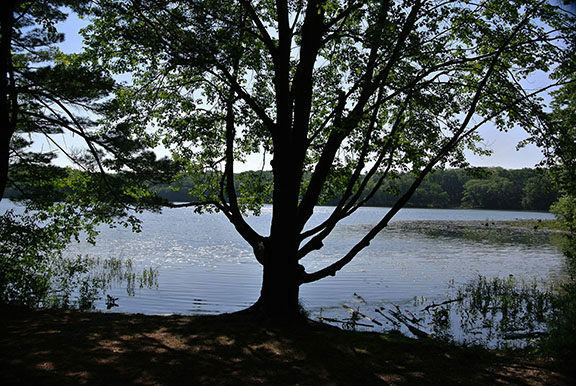 Yankee Springs also has several campgrounds, including a modern facility on Gun Lake. Because the 200-site campground is filled throughout much of the summer, it’s considerably easier to obtain a site in the park’s Deep Lake Campground, a rustic facility of 120 sites. A state park vehicle permit or daily pass is required to hike or camp at Yankee Springs. Yankee Springs is a 30-minute drive from either Grand Rapids or Kalamazoo off US-131. From the highway, depart at exit 61 and follow County Road A42 east for 7 miles to its junction with Gun Lake Road and turn right. From the east, head west on M-37 from Hastings for 2 miles, then turn onto Gun Lake Road (also A42 at this point) to reach the park in 10 miles. 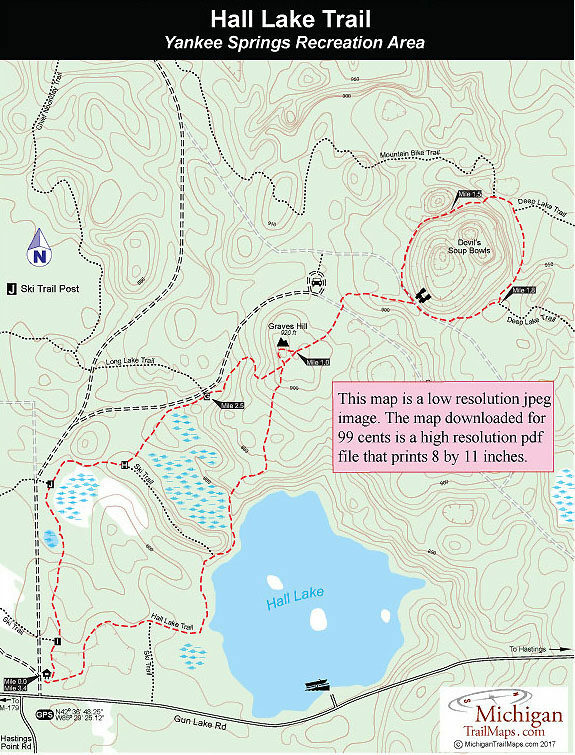 The trailhead for Hall Lake Trail is marked across from the entrance of Long Lake Outdoor Center, posted along Gun Lake Road 2 miles from County Road A42 or 1.5 miles beyond the park headquarters. 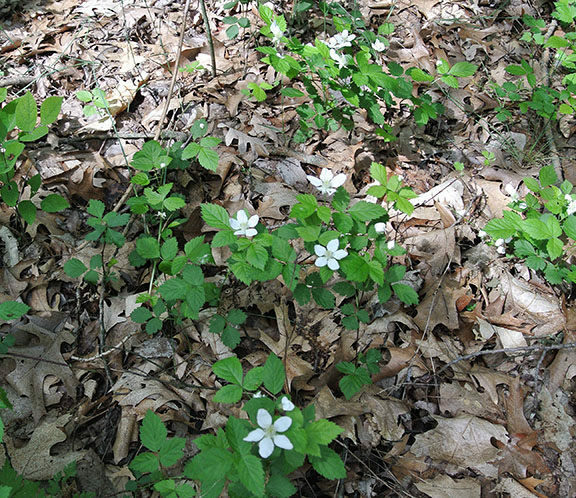 Contact the Yankee Springs Recreation Area headquarters (269-795-9081). For lodging or additional travel information contact the West Michigan Travel Association (616-245-2217; www.WMTA.org).